Kate Evans is an adventurous and independent young woman with a pioneering spirit. She pilots a mail-delivery plane in the forbidding Alaskan wilderness, the lone woman in a male profession. But even that seems easy compared to finding true love. She likes a fellow pilot and would even consider marrying him--if it weren't for Paul, a mysterious man on her mail route with a gentle spirit and a past to hide. Can Kate break through the walls Paul has put up around his heart? And will her quest for adventure be her demise? I have to admit, I have been so behind on getting my book reviews done. Trying to make my site more personal and keeping up with my Marvelous Mom Reviews site has left very little time to read. When I tell my friends this, they look at me with dropped mouths. They know me, and my passion for reading. Well, reading Bonnie Leon's first book in her Alaskan Skies series has hopefully gotten me back on track. I have loved Touching the Clouds since page one. We are propelled into the wilds and harsh climate of Alaska. As a reader we are able to live through Kate Evans, a bush pilot who, as a woman has a lot to prove in this rugged land. This book is set in the 1930's and I'm a lover of historical fiction. I felt like I was right there with Bonnie's writing! Even being in Alaska in this time period, you have a sense of being drawn back to the past. I enjoyed reading the trials Kate goes through as she feels she has to constantly prove herself, mostly to herself, and as she's drawn into the lives of those she interacts with on her flights. So many of the people she sees rely on her for so much. I was really sucked into the story line and sometimes I felt like I was flying right along with her. Being that we're just coming into our winter, I thought this would be a fantastic book to read and get a feel of the cold and darkness of the beautiful Alaska! 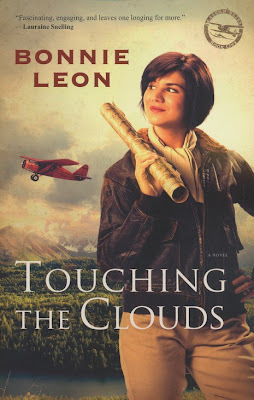 Bonnie Leon is the bestselling author of more than ten historical fiction novels, including Touching the Clouds. She stays busy teaching women's Bible studies and speaking at writing seminars and conventions. She and her husband, Greg, live in Oregon. *I received my book as a gift from the author and publisher. The review is my own and not influenced by anyone.